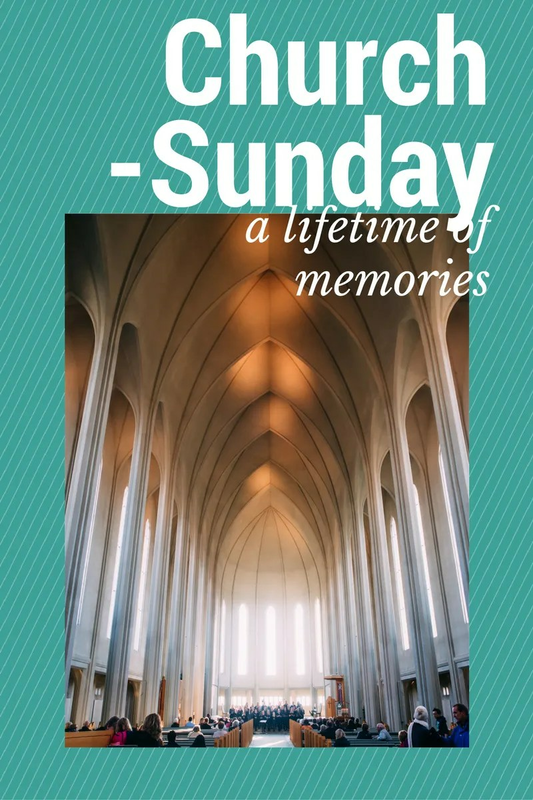 Mom always loved going to church and the memories of Sunday school; ice cream socials even the smell of the church itself brought a flood of memories streaming through me like watching an old movie. I remembered singing in the choir with Mom, bake sales, and all the social activities. As I watched Mom, I wondered if she remembered at all. The look on her face did not strike me as one of familiarity. As the day went on, I became more comfortable with her memories. I worried about her remembering, enjoying herself – it was different now. I could see that the further back in time, the more she remembered. She was content and I needed to accept that her memories was enjoyment. Far be it for me to judge what was a familiar memory, joyful or what was not in her mind, she was happy and that is all that mattered. I had to learn to get out of my own way and just keep her safe and content and enjoy our moments together. I spent far too much time and energy worrying about her state of mind. Let it be, my grandmother used to say, just let it be. Words of wisdom for your journey into this Dementia Land, just let it be and enjoy the trip. That Dementia Land moment when you fear your loved one might embarrass themselves or … being completely honest, embarrass you. An excerpt from my book I Miss You Mom, a Daughters Journey into Dementia Land. Mom was a member of the same neighborhood church since its inception. They were having an event during the anniversary service to honor their lifetime members and she was invited. My son, Sam and I took her to be recognized. At the church, Mom was invited to sit in the front pew so that she could stand up when the time of recognition came. She was in her usual state of confusion and the hostess asked if I thought my mother would like to say a few words. I thought about it, and told her that I honestly had no idea what Mom might say. Since she had been on many a stage, even though this was her church, I didn’t know if she would think she had to sing, or perform or could track why she was there. So, I was anxious when the time came. They did a very nice job recognizing every honorary member. Sam helped his grandmother walk up front and while all six of the silver haired honorary members were proudly standing in front, they passed the microphone and asked if there was anything each of them wanted to say. A few people commented, and when Mom’s turn came, I was on the edge of my seat. It was a good day, and one that I didn’t want to end. The sun was nearly straight overhead when we left the church, so I headed the car toward the restaurant where Mom’s neighbors often had their Sunday brunch. Sure enough, Cory’s car was in the parking lot. Claire’s Pantry hadn’t changed since I was in Junior High. The odor of freshly baked cinnamon rolls was exactly the same the moment we opened the front double door, and it seemed like Mom remembered as she sniffed. I felt at home and was sure Mom did, too, as we approached the hostess. Why, of course we could go and look for our friends, she smiled as she waved us on. Past the bar and its slight odor of stale cigarettes and beer, we made Mom’s grand entrance into the lounge, and there they were, all six of them sitting in their favorite spot by the windows at a corner table. She was in rare form and her audience didn’t let her down. “Corrine,” Louise shouted. They had been friends since they were pregnant with Cory and me, fifty years ago, and neighbors all that time. “How wonderful to see you out and about again,” Louise went on. “Come, sit next to me!” Chuck, Louise’s husband, stood up and asked the waitress to pull over another table and chairs as he greeted mom with a big hug. Cory’s younger brother, Eric and his niece Jessica adjusted their chairs to make room for us. … I ordered a senior eggs with toast for Mom and eggs Benedict for me, while she entertained Louise’s family with stories of Cory dancing on her coffee table as a kid, and of the wild youngster he had been – fast cars in high school and all that went with his teen years. While I was catching up with Milari, Louise ordered Mom a glass of chardonnay, her friend’s favorite wine. Cory told Mom how much he missed Walt’s visits, and told us all tales about Dad. “Walt always seemed to be outside when I drove by and he still waved his arms wildly’ yelling at me to ‘slow down’ just as he did when I was in high school!” Cory occasionally stopped by and visited with my parents when he was in the neighborhood. Milari and Mom discovered that they had both worked at Nordstrom and knew some of the same people. At least one more glass of wine was ordered and willingly consumed, and I know Mom was a little tipsy when she hugged everyone goodbye. What the heck, I thought, she doesn’t get much of a chance to live it up with all her food and beverages controlled at the Home. This outing had to be good for her; it was just like old times! Among the moments of embarrassment and frustration, there are moments of recognition and joy in Dementia. Returning to places and faces that are familiar can help your loved one access easier to retrieve older memories. Do both of you a favor. Seek the joy and share those memories as long as you can.